Motor Cycle Movement in Germany. Expected Revival on Account of Prohibitive Costs of Running a Car. B.M.W. 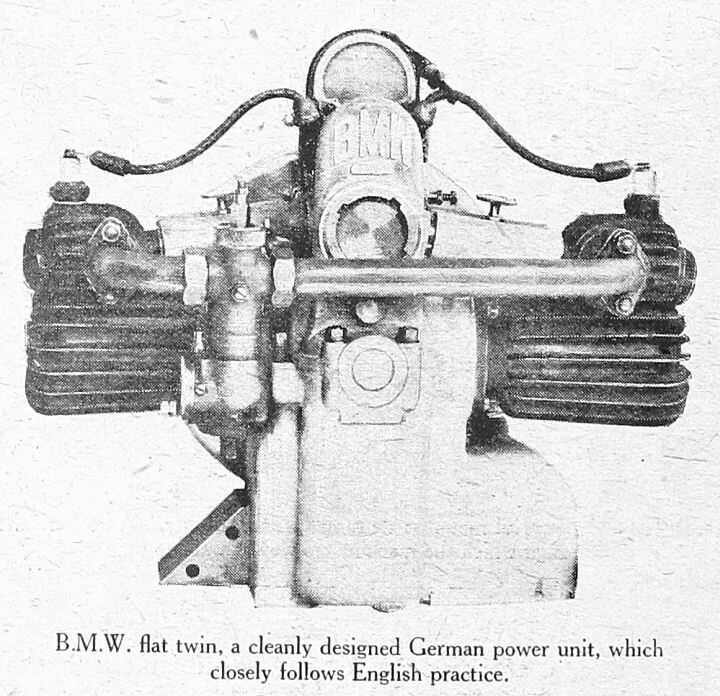 flat twin, a cleanly designed German power unit, closely follows English practice. THERE is no equivalent in Germany to the immense motor cycle development of England, nor anything like the healthy revival to be found in France. In all Germany has thirteen motor cycle manufacturers, the great majority of these making nothing but two wheelers. The only big car producing firm interested in motor cycles is the Adam Opel Co., at Russelsheim. This firm has produced a lightweight machine since the war, and is offering it at what is considered to be, in Germany, the exceptionally low price of 5,000 marks. This is really cheap in comparison with the price of 20,000 marks for a twin N.S.U. The Opel machine would be considered in England a motor-assisted bicycle. It has a strengthened bicycle, frame and a tiny single-cylinder engine driving to the rear wheel bv means of a chain. Reminiscent of a well-known English design, a flat twin engine specially designed for motor cycle or cvcle car work has been produced by the Bayeerisch Motoren Werke, near Munich. This firm has a very fine factory, erected during the war for the construction of aeroplane engines. Since the Armistice the works have been converted, and among the new products is the llat twin air-cooled engine shown in the accompanying illustrations. His design is wonderfully neat, and the engine is most up to date in every respect. The two cylinders, which have enclosed side by side valves, are mounted on ail aluminium base chamber which forms an oil reservoir. The crankshaft is mounted in ball bearings, the connecting rods are tubular, and aluminium pistons are used. The flywheel is external, and the magneto, a high-tension Bosch, is placed on the top of the crank case. It is claimed that the engine will run under load at 3,400 revolutions, and will turn over at 5.000 revolutions without load. It is the intention of the B.M.W Co. to produce this engine in quantities for the trade. Very few motor cyclists are seen on German streets and roads. Indeed, during a very extensive tour through that country not a single touring motor cyclist was observed, but a certain number of motor-assisted cyclists were met in the leading cities. The reason for this neglect of the motor cycle, is the high cost not only of machines, but of fuel, tyres, and repairs. Until a very short time ago motoring could only be indulged in with a special permit. It is now free, but petrol is very expensive, the legal price being 4 marks 50 per litre, but it is practically impossible to obtain it at this price. The use of a car has gone beyond the means of any but a few nouvraux riches, and it is because of this that the motor cyele industry is believed to offer possibilities. It will be several years, however, before even this form of economical motoring becomes really common. Source unknown, but most likely from The Motor Cycle of 1923.